The main function of WPBanner is to create adverts for your website. Creating adverts in WPBanner is super easy. While setting up every advert has different settings that fulfills your requirements. 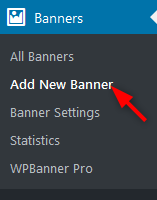 Here’s how to create new advert in WPBanner. Go to the Banners menu in your Dashboard and click on “Add New Banner”. First of all enter the title (Banner name). Then choose a type for advert “Standard Banner / Ad Code”. Each type has specific options. After choosing the type of advert select where do you want to show the advert. Configure different settings for your advert provided by WPBanner. Set the banner’s schedule setting. Once done click the “Publish” button and you advert will be published on the website.